3 EMMYS, A STAR ON THE HOLLYWOOD WALK OF FAME. Barbara Bain has appeared in over 30 movies and 20 television series. Ms Bain has recently been awarded Best Actor for the film Pacific Edge at the LA Film Festival. 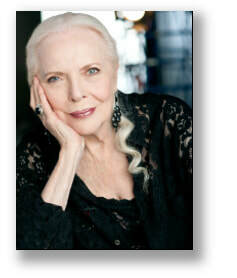 We are delighted to be representing Barbara Bain. Barbara Bain was born in Chicago, graduating from the University of Illinois with a Bachelor's Degree in Sociology. She then relocated to New York City where she gained work as a dancer and high-fashion model. Ms. Bain studied with Martha Graham, permanently cementing her love of dance; however, it was with Lee Strasberg at the prestigious Actors Studio that she discovered her true first love - acting. She is probably best known for her work in the landmark television series MISSION: IMPOSSIBLE, created by Bruce Geller, where she created the pivotal role of Impossible Missions Force Agent "Cinnamon Carter", and, in the process, became the first actress in the history of television to receive three consecutive Emmy Awards for Best Dramatic Actress. Ms. Bain followed with the role of "Dr. Helena Russell" in the now classic British syndicated science fiction television series SPACE: 1999, created by Gerry Anderson and Sylvia Anderson. Her stage work has garnered her Los Angeles Critic's Circle and DramaLogue Awards for her work on Arthur Kopit's "Wings", Samuel Beckett's "Happy Days" and Eugène Ionesco's "The Chairs". Ms. Bain has worked on behalf of numerous charitable causes and is the founder of the Screen Actors Guild's "BookPals" Program which currently has some 300 of her colleagues reading to children in Los Angeles schools. Following it's success MS. Bain helped develop "StoryLine Online, which has evolved into storyonline.net. It currently has 14 million hits per month world wide.